Jared Burton picked up the save Thursday night. The Twins are now carrying 13 pitchers, eight relievers, on their 25-man roster, and unless the starting rotation suddenly discovers how to pitch seven innings consistently, that's probably going to be the rule the rest of the season. We can divide the eight into two four-man groups, the guys who pitch in game situations and the guys who are there to eat innings. Then we can further break the groups down into more specific roles. Group A has Glen Perkins, Jared Burton, Casey Fien and Brian Duensing. Closer Perkins and set-up man Burton are reserved for the late innings. They generally don't pitch when the Twins are behind — the exceptions coming when the Twins have so seldom held a late lead that they haven't had any work for a while — and generally start innings rather than come in with men on base. Group B consists of Josh Roenicke, Anthony Swarzak, Ryan Pressly and Caleb Thielbar. These four have worked a lot of long relief and mop-up — too much of each, really, which is why there are now eight relief pitchers. Roenicke has straddled the boundary between the two groups — he's been the alternative to Fien as the middle-innings get-out-of-a-jam rightie, but he's also been used as a long-relief alternative to Swarzak and Pressly. Alternatives were needed Thursday. 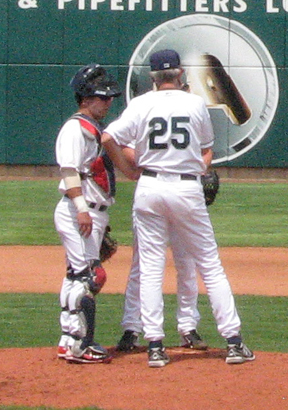 Perkins had pitched three straight days, so manager Ron Gardenhire had shelved him for the day. Fien had pitched three out of four days, so he was also on the do-not-use list. That led to a juggling of roles, which did not go universally cleanly. When P.J. Walters, who had a big lead, needed help in the seventh inning, it was Roenicke who got the call, not Fien. Roenicke struggled with his command. Both the inherited runners scored. Duensing was called on to start the eighth inning, which is usually Burton's role, but he retired only one of the three hitters he faced. Pressly came in to get the last two outs (allowing the inherited runner to score). Burton had a no-drama ninth to wrap up the win. Pressly is an increasingly intriguing bullpen option. As a rookie claimed in the Rule 5 draft last December, he has not been used often in high-leverage situations, but he gave Gardenhire two shutout innings in the 14-inning win Tuesday night and snuffed out the Brewers threat in the eighth Thursday. He has, with the exception of Perkins, the highest velocity arm in the Minnesota bullpen. He's younger than either Fien or Roenicke. I rather expect Gardenhire to increase Pressly's role — first by supplanting Roenicke as the marginal seventh-inning jam rightie, then perhaps by challenging for Fien's role. More bullpen depth is always a plus. Joe Mauer is the Twins' best No. 3 hitter. He's their best No. 2 hitter. And, really, he'd be their best leadoff man, best cleanup hitter, best No. 9 hitter. He's their best hitter, period. If the Twins had nine Joe Mauers in the lineup, they'd score (using his career stats) a bit more than seven runs a game (eight runs with 2013 stats). They only have one Mauer, however, and so they're scoring 4.28 runs a game, 11th in the American League. 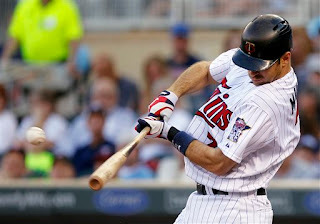 Until this week, Mauer had been hitting second all season. Ron Gardenhire moved him back to his accustomed third spot on Monday. On Wednesday night, the Twins led off with Eduardo Escobar (career OBP .275, 2013 OBP .271) and followed with Brian Dozier (career OBP .266, 2013 OBP .255). It worked, more or less; the two outmakers opened the game with base hits and scored first inning runs, and the Twins won 4-1. But over the long run, giving guys like that extra at-bats is suicidal. There's a growing sabermetric consensus that one's best hitter should hit second. I suspect the improvement is only marginal. I would prefer that Mauer hit second, but I don't think there's a huge difference between hitting him second or third. There is, however, a larger difference between hitting somebody like Dozier second or sixth (or preferably lower). Each lineup slot, over the course of the season, represents a difference of a couple dozen plate appearances. Hitting Dozier second all year as opposed to sixth means giving him about 100 more trips to the plate — and at a .255 OBP, that means he's making about 75 more outs. The specific problem with the lineup Wednesday wasn't so much the batting order as the personnel. The Twins had three established major league hitters (Mauer, Josh Willingham and Ryan Doumit) in the lineup (and two of the three have not performed to their usual levels this year). The other six have career OPS (on-base plus slugging) of .570 (Escobar); .582 (Dozier); .722 (Chris Parmelee); .232 (Chris Herrmann); .563 (Aaron Hicks); and .619 (Pedro Florimon). Parmelee's figure is a touch below league average; the rest, albeit in limited at-bats, are far below average. It doesn't really matter if Mauer-Willingham-Doumit hit 2-3-4 or 3-4-5 when they're surrounded with that level of hitters. a home run and a double Tuesday. The Twins and Brewers rode the see-saw Tuesday night. Highlights for the Twins included a homer-saving catch by Aaron Hicks off Carlos Gomez (and Gomez' cheerful doffing of his batting helmet in salute of the play, another example of Gomez' endearing enthusiasm); homers by Hicks, Josh Willingham and Ryan Doumit; and Ryan Pressly's three-strikeouts-in-two-innings relief stint for the win. And Milwaukee shortstop Jean Segura deserves notices for his six hits (seven at-bats). Segura is now hitting .365; the first five men in the Brewers batting order Tuesday left the game hitting .301, .365, .309, .311 and .326. Batting average is just part of the offense, but a string of .300 hitters isn't a bad foundation to build on. Still, one marvels at the inadequacy of the Milwaukee first basemen. 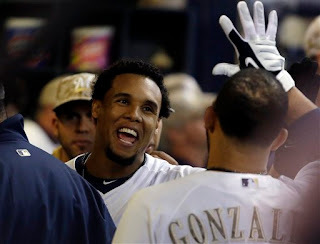 To be sure, the Brewers have lost Corey Hart and Mat Gambel to injuries, but still ... they've been playing shortstops at first most of the season, Alex Gonzalez and Yuniesky Betancourt. Neither is a particularly good hitter for a shortstop, and as first basemen they are simply pathetic. A major league organization ought to be able to do better than that at first base. Monday in the Milwaukee dugout. With free agency and arbitration and ever-shifting budgetary concerns, it makes sense for teams to limit their future focus to five years. Five years is the period of team control for a rookie. This is the fourth season since the Twins traded away Carlos Gomez, the sixth since the Twins acquired him in the Johan Santana trade. Only now is the outfielder emerging as a legitimate star. It took Go-Go years to find the key to his toolbox. Could this have happened while he was with the Twins? There may have been a language barrier. Go back to spring training 2008. The 2007 Twins had one good outfielder, Torii Hunter (Michael Cuddyer had missed much of the season with injury), and Hunter had left as a free agent. The Twins traded for Delmon Young to fill one outfield spot, and had a spring training competition for center field among farm system product Denard Span trade acquisitions Gomez and Jason Pridie. Span was the best of the three that spring, but it was Gomez who came away with the job, probably because the front office wanted something immediate on the field from the Santana trade. Gomez was just 22, and he had been pushed too quickly up the Mets system before the Twins got him (a chronic problem with Mets farmhands at the time). He wasn't ready to deal with major league pitching. The Twins compounded the problem by forcing him into the leadoff slot. Span's skill sets lend themselves to a table-setter role; Gomez's do not. (Even now, Gomez has drawn just nine walks this season.) This just increased the frustration felt by team management with Gomez, who was being asked to do something he wasn't likely to succeed at. Span came up in midseason and gave the Twins a legitimate leadoff hitter. By midseason 2009, Gomez was clearly on the outs with Ron Gardenhire, who was more willing to live with Young's flaws than Gomez's. That, I argued at the time, was a mistake. Gomez's defensive skills more than made up for whatever offensive difference there was between the two — and the hitting stats at the time weren't that far apart. I continue to wonder how much of the difficulty the Twins have had developing Latin players in recent years can be traced to the lack of Spanish speakers on the coaching staff. Gomez. Francisco Liriano. Alexi Casilla. Only through the offseason shakeup of the coaching staff this year have the Twins added a Spanish-speaking coach (Bobby Cuellar), and even he's out in the bullpen during games. 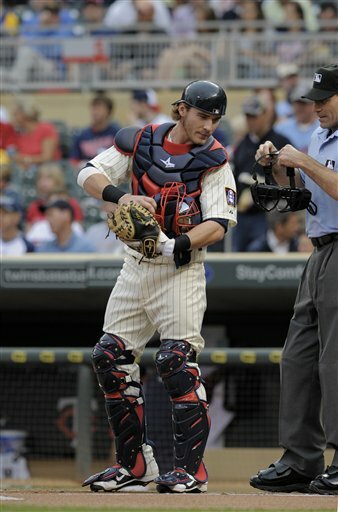 The Twins traded Gomez soon after the 2009 season for J.J. Hardy, and Gomez was the same frustrating player for the Brewers for two years that he had been with the Twins. Just as he had lost the center field job in Minnesota to Span, he lost the job in Milwaukee to Nyjer Morgan. But Morgan wasn't/isn't as good as Span, and last year Gomez reclaimed the center field job. And now he's clearly a better player than Span, or Young, or anybody else who was taking playing time from him earlier in his career. It was a long time coming — more time than the Twins expected six years ago, arguably more time than they could afford to invest in him. was one of three contenders for the Twins center field job. Baseball is a difficult sport to master. High draft picks in the other major team sports routinely step immediately into starting lineups; in baseball they universally spend time, often years, in the minor leagues honing their skills. And some of them, a lot of them, never make it. That Joe Benson was a highly regarded prospect is obvious; he was the Twins second-round draft pick in 2006 (Chris Parmelee was their first-rounder), and he twice cracked Baseball America's Top 100 prospects, albeit barely (No. 100 in 2011, No. 99 in 2012). After his September 2011 callup, it seemed just a matter of time before he became a fixture in the Twins outfield. Last weekend, the Twins needed a spot on the 40-man roster so they could activate P.J. Walters to make Saturday's start. They got that spot by waiving Benson, who was claimed by the Texas Rangers. Benson almost cleared waivers; Texas was the next-to-last team in the progression. Only St. Louis didn't have the opportunity to claim Benson. Benson's 25 now, and he still possesses the athletic gifts that made him a high draft pick. But he's made almost no progress in the last couple seasons turning his speed and strength into usable baseball skills. He left Rochester, the Twins' Triple A affiliate, with a slash line of .192/.256/.285; this follows an injury-plagued 2011 in which he combined at four levels for .202/.288/.336. This season he had 10 walks and 51 strikeouts in 165 plate appearances. The Rangers shipped him down a level, to the Double A Frisco Roughriders of the Texas League, and he hit a home run Sunday in his first game there. He also struck out once. He's still young enough to find the ballplayer in the talent. But he has a long way to go, and it was increasingly obvious that it wasn't going to happen with the Twins. I don't blame them for pulling the plug. hit him in the chin. 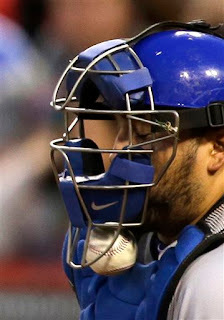 Ah, the joy of being a catcher. All that padding, all that protection, and the ball still finds a way through. but he's returning to Triple A this weekend. No matter which stat you want to lean on, Oswaldo Arcia has been one of the better hitters in what has been a rather punchless Twins lineup. Ten hitters have had more than 100 plate appearances for Minnesota this season. Arcia, whose 107 plate appearances is lowest on that list, ranks third in batting average (behind Joe Mauer and Justin Morneau) and on-base plus slugging (behind Mauer and Josh Willingham), second in slugging percentage (behind Mauer), tied for second in home runs (behind Willingham). Demoting Arcia is probably for the best. Arcia had just one hit in his last 18 at-bats, three hits in his last 29. Pitchers had essentially stopped throwing him fastball strikes, and he wasn't adjusting well to the steady diet of breaking balls and changeups. And, to be blunt, if he ain't hitting, he ain't helping. 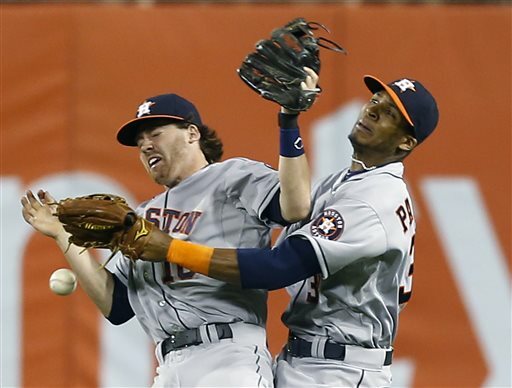 His defensive skills are not strong; Chris Parmelee is a better defensive outfielder. Arcia's a good hitter, or at least he's going to be a good hitter, and he'll adjust. He'll get his at-bats in Triple A, and the Twins will save on his service time while he's getting those at-bats. He'll be back. Kyle Gibson, Sam Deduno, P.J. Walters and "consistency"
Word trickled out Thursday evening that P. J. Walters will inherit Vance Worley's rotation spot on Monday. How the space will be cleared (on either the 25-man active roster or the broader 40-man roster) is unclear; the Twins still have to make room on the 40-man roster for Sam Deduno, who is to start tonight in Detroit, much less make room for Walters. The Twins' public rationale earlier this week for going with Deduno over Kyle Gibson — that Deduno has a good record against the Tigers and that Gibson needs to show more consistency — was a bit baffling. Deduno started twice last season against Detroit and came away with a 9.64 ERA, which is neither good nor sufficient statistical evidence to make a judgment on. 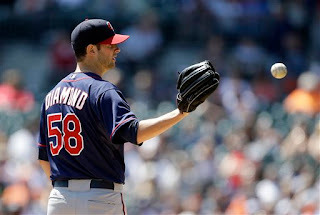 As for the consistency issue: Is there any pitcher anywhere more consistently inconsistent than Sam Deduno? Giving Deduno the chance over Gibson doesn't really disturb me. Deduno's raw stuff is intriguing, and he probably would have been in the opening rotation had he not injured his groin in the championship game of the World Baseball Classic. But going with Walters over Gibson ... that's another matter. Gibson is supposed to be, eventually, a rotation anchor. Walters is back-of-the-rotation filler at best, more likely a "Quadruple-A" guy — good enough to thrive in the upper minors, not good enough to survive in the majors. One of the top goals this season for the Twins has to be establishing Gibson in the major league rotation. This would seem a good opportunity to start on that project. Instead, the Twins are going with a low-ceiling alternative. They must have a reason for that, but I really don't see what it is. Walters and Gibson have very similar records in Rochester this year. Gibson is 3-5, 3.25 with 52.2 innings in nine starts and 7.9 strikeouts per nine innings; Walters is 4-2, 3.31 in 54.1 innings in nine starts and 7.6 strikeouts per nine innings. In total, there's isn't much difference between the two state lines. Gibson has alternated brilliant starts with short, dismal ones. Perhaps the basic stuff is different from game to game, which would suggest lingering physical issues related to his rehab from Tommy John surgery. If that's the consistency the Twins refer to — being able to bring the same velocity and movement to each game — then I can grasp the point in leaving him in the minors. If the argument is that the results aren't consistent, I'm not buying it. I've spent the last few days writing about the talent on the Cedar Rapids Kernels, and it's certainly been more fun thinking about that team (hey, Byron Buxton hit a triple Wednesday!) than about the Twins. Monday's post, written in a Cedar Rapids hotel room after an afternoon spent driving and listening to the Sunday game/rain delay, anticipated a coming roster shuffle. Changes have come, and more will, because the active roster is a starting pitcher short. Pedro Hernandez demoted, Caleb Thielbar promoted. Fifth starter out, eighth reliever in. I've always expected the Twins to shuffle through fifth starters in search of somebody who might emerge; I didn't expect Hernandez to get his opportunity as early as he did. Thielbar quickly joined the ranks of overused mop-up men in the bullpen. Tuesday night while breaking up a double play. Trevor Plouffe put on concussion list; Darin Mastroianni put on 60-day disabled list; Chris Colabello put on 40-man roster and on the 25-man roster. 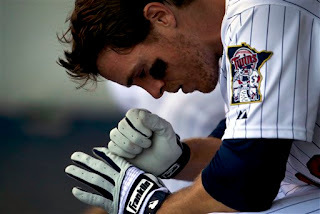 The Twins' recent history with concussions — Justin Morneau and Denard Span — has not been a happy one, and the sight of Plouffe taking a shin to the temple raised too many bad memories for Twins fans. Nobody really knows what to expect from concussions, so there's no point in me speculating about how long Plouffe may be out. Colabello gives the Twins right-handed power, but he's a first baseman-DH, and as such an ill fit on the major league roster as constituted. 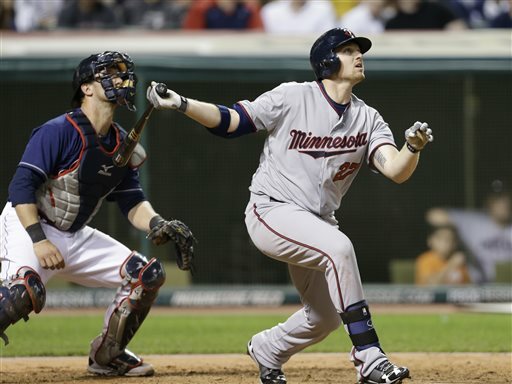 If he remains, Chris Parmelee or Oswaldo Arcia are likely to get shipped back to Triple A. Third base figures to be handled by a combination of Jamey Carroll and Eduardo Escobar, neither of whom offers Plouffe's pop. I wrote about Mastroianni's status in the Monday post. Vance Worley demoted, Sam Deduno to be promoted. Worley has gone from Opening Day starter to Triple A in less than two months, which is what a 7.21 ERA can do to a fellow. 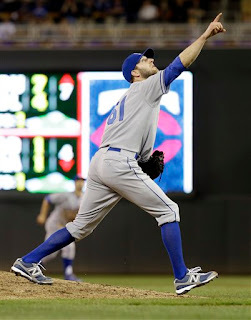 "The Vanimal" has been the biggest disappointment in a rotation that has been almost completely disappointing. Deduno has been slated all week to fill Hernandez' rotation slot but hasn't been officially added to the roster yet. One aspect here is that the Twins need another spot on the 40-man roster as well. This may well be found by moving Tim Wood to the 60-day disabled list. All this still leaves the Twins a starter short. Somebody has to take the ball in four days, when Worley's turn comes around again. My guess: Kyle Gibson. It might have been Gibson for Friday's game except that they don't want to debut him against Detroit. It was a stormy trip Sunday and Monday — a blinding downpour around Albert Lea on the way down, another one on the way back, tornado watches, and an overnight storm in Cedar Rapids. Nothing like the disaster that visited Oklahoma City on Monday, but the overnight storm in CR knocked out power to Veterans Memorial Stadium and forced the game, scheduled for noon, to be put off until 1:30. In truth, it was impressive that the game got played at all. 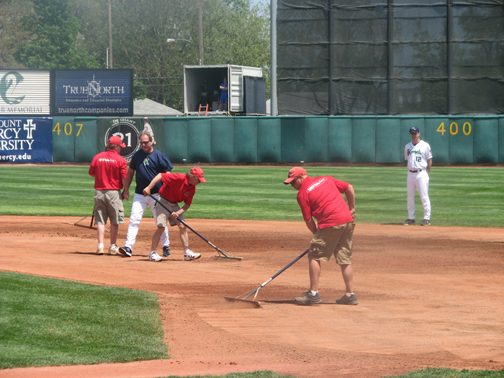 At one point as the grounds crew worked on the playing field, the Kane County manager walked the infield and tested the footing, then talked to the crew. There was one moment when it appeared the field was an issue. Bryon Buxton fielded a base hit in the second inning and tried to plant a foot to pivot and throw, but the ground did not hold. Buxton regained his footing, conceded the base and tossed the ball back into the infield before replacing his divot. But I couldn't help but wonder if there would be ramifications if Buxton blew out a knee on a wet field. A Kernels player of interest I didn't see was Adam Brett Walker, who the Twins drafted last June in the third round. Walker's power is said to comparable to Miguel Sano — which is to say it's top-of-the-charts — but there's been some question about his hit tool. Lots of strikeouts, lots of swing-and-miss. But he bopped 14 homers for Elizabethton last summer after signing, and he already has 10 for Cedar Rapids. All I saw him do Monday was coach first base. Kane County features a couple of ponderous first basemen. Dan Vogelbach, who played first on Monday, is listed as 6 feet, 250 pounds; I suspect the listing is generous on the height and understates the weight. He's got a Prince Fielder build to him. And he hit several balls hard; 2-for-5 with two RBIs and a monster foul ball. Despite the bulk, he seemed fairly nimble around the base and scooped a couple of poor throws from his infielders, something Fielder frequently struggles with. The other is the wonderfully named Rock Shoulders. With a moniker like that, he has to be a powerfully built fellow — it's impossible to imagine a scrawny guy named Rock Shoulders — and he fits the bill at 6-2, 225. Shoulders, the DH Monday, drew three walks and went 0-for-2. Jorge Polanco, playing shortstop, reacts to a pitch. Byron Buxton may be the biggest reason for Minnesotans to make the trek to Cedar Rapids to see the Twin's low-A affiliate, but the Kernels have a number of other significant prospects on the roster. hand at first base Monday. Not all of them were in the lineup Monday, and some of those who were, were in unusual positions. D.J. Hicks, the usual first baseman and cleanup hitter in Jake Mauer's lineup, sat out Monday's game. Niko Goodrum is usually the shortstop and No. 2 hitter; on Monday he played first base and hit third. Jorge Polanco, usually the second baseman and No. 3 hitter, played short and hit cleanup. Travis Harrison was at his accustomed third base and hit fifth. Goodrum, Polanco and Harrison are all significant prospects. Goodrum was a second round selection in the 2010 draft. Polanco, still a teenager (he turns 20 in July) was signed as a free agent out of the Domincan in the same summer as Miguel Sano; Sano's signing overshadowed Polanco's, but Polanco got a $700,000 bonus as a 16-year-old, evidence of his perceived talent. And Harrison was a supplemental first round pick in 2011. Polanco has hit probably better than anticipated the past two seasons (he was hitting .326 on the season Monday, according to the scoreboard), but his arm has been described as probably too weak for shortstop. I'll buy that critique. He had one play Monday on which he ranged well to his left to scoop the grounder only to make a terrible throw to first base. He had another in which he backhanded the ball but then dropped it trying to hurry his transfer. The problem for Polanco as a second baseman is that Eddie Rosario, an even better-regarded prospect, is playing well there a level ahead of him. It makes sense for the Twins to try to push Polanco at shortstop. At the plate Monday, Polanco was 0-for-3 with a walk and a sac fly. Goodrum didn't look like a novice at first base, but he's not likely to have that position be a big part of his future. He's listed as 6-foot-4, 200 pounds, and he looks it — long and slender. He was 1-for-4, but what a one — a bases-loaded triple in the sixth that put the Kernels ahead to stay. He's not as fast as Byron Buxton (who is?) but he flew around the bases on that triple. The big question with Goodrum is whether he's destined to play short, and watching him play first does little to suggest an answer to that question. I'm not sure he has the bat to play a less demanding position. Harrison can hit, and showed it: 3-for-4 with a home run. But his ability to remain at third base has been questioned, and he didn't look good in the field. Some third basemen can get by with range that amounts to a step and a dive; Harrison didn't show even that Monday. Like Polanco, Harrison is a level behind a better prospect at his position (in Harrison's case, Sano). I rather suspect one of the two will wind up at first base if they both become regulars with the Twins. There are 13 active pitchers on the Cedar Rapids roster. Four of the names are of particular interest to me: J.O. Berrios, the teenager who pitched for Puerto Rico in the World Baseball Classic; Hudson Boyd, a high draft pick in 2011; and Tyler Duffey and Mason Melotakis, two of the college relief aces the Twins drafted last summer and are trying as starters. As luck would have it, I saw none of those four Monday. Brett Lee, a lefty, started; he gave up six runs in five innings. He walked four, struck out five, hit a batter, committed a balk, gave up six singles and a double and got little help from his infield defense. Tim Atherton, a righty from Australia, gave the Kernels two strong innings of relief (only two fair balls hit off him) and earned the "W"; Steve Gruver, another southpaw, finished with a strong eighth and a shaky ninth for the save. Nothing grabs me there for commentary. The catcher was a another matter. Tyler Grimes was drafted in the fifth round in 2011 as a shortstop out of Wichita State. He signed immediately and was assigned to Beloit, an aggressive placement by Twins standards. He hasn't moved up; this is his third season in the Midwest League, and he has a career batting average of .209 in low A ball.. The first two years he was a shortstop; this year the Twins have moved him to catcher. He hasn't played an inning elsewhere. He didn't look bad back there to me. He picked off a runner at first base to end the first inning. He handled a pair of popups without much difficulty. And at the plate he smacked a pair of hits, a single and a double, in four at-bats. I don't know if Grimes is going to make it as a catcher. It seems clear that he wasn't going to make it as a shortstop. A lot will depend on how well he hits, obviously, and while there is precedent for a player to hit better when playing a less demanding position, that's not what's happening here. frame before the bat landed in his first at-bat Monday. Last week, in taking note of a dramatic game-ending grand slam by prized Twins prospect Byron Buxton, I said I'd better get a move on if I'm going to see him play for Cedar Rapids this year, because he might be promoted quickly to Fort Myers. And so it was that I essentially burned two days off — Sunday and Monday — to see one minor league game. Monday afternoon, the Kane County Cougars (Cubs affiliate) at Cedar Rapids. I have plenty of observations to make from that game, and I'll dole them out over the next few days, but today's post will be about Buxton, because he was the big reason for the trip. Buxton homered in his second at-bat, a majestic fly ball that flew over everything in left field. That was his only hit in five trips to the plate. He struck out twice, reached on an error and was retired on a grounder to third. Byron Buxton awaits a pitch. And he made two magnificent catches in center field. In the first inning, Kane County's Gioskar Amaya drove a ball to deep center. Buxton made the catch with his back to the infield and hit the fence on his next step. The impact knocked him down, but he got up quickly. In the ninth, Pin-Chieh Chen drove a liner to left-center. Buxton made a diving catch just before the ball found the grass. Tom Kelly has said that Buxton is the fastest player he's ever seen, and I saw some of that in play Monday. He hit a one-hopper in the first inning right at the third baseman, and the throw only got him by a step at first base. Buxton led off the fifth. He tried a bunt and fouled it off but ran it out as if to show us all how fast he is and how easily that speed comes. He followed with a soft grounder to short; the shortstop charged the ball and juggled it trying to make a rapid exchange from glove to throwing hand, and Buxton was safe. It was ruled an error, and I suppose that, had the shortstop made the play perfectly, he would have been out. I suppose. It certainly would have been a close play. I'm convinced: There is no such thing as a routine groundball out to the left side with Buxton. Having reached first, he stole second base easily. He then came around on a pair of ground outs. 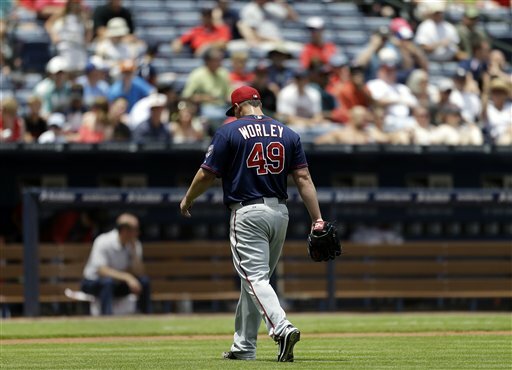 The Twins on Sunday wrapped up a miserable 2-7 homestand with yet another loss in which the starting pitcher left way too many innings (and too big a deficit) to the bullpen and the lineup failed to produce. Something is going to change pretty soon. And one avenue to a roster shakeup opened Sunday when the Twins announced that outfielder Darin Mastroianni, who went on the 15-day disabled list in mid-April with what was called a "stress reaction" in his left ankle, would have surgery to remove a bone chip from that ankle. I'm no orthopedic specialist, but as I understand it these are not the same injury, but the stress reaction (and the attempts to test the recovery from it) may have led to the bone chip. Whatever the medical background, Mastroianni will not be back until sometime after the All-Star break in July. If the Twins were waiting for Mastroianni to return to pull the plug on Aaron Hicks as the regular center fielder -- and I don't really think that's the case -- they need to come up with another idea. If the Twins want to call up a player who isn't now on the 40-man roster -- the red-hot Chris Colabello, for example -- they can shift Mastroianni to the 60-day disabled list, which would remove him from the 40. The Twins' new road trip includes their first interleague road games, which means no DH, which means that two of the hitters they want to have in the lineup will be on the bench. One of them will likely be either Ryan Doumit or Joe Mauer, since one will catch and the other won't DH. And the other will come out of the Chris Parmelee-Oswaldo Arcia-Josh Willingham-Justin Morneau foursome. Given how abused the bullpen has been the past week, I wouldn't be stunned if the Twins finally went to the 13-man staff I expected at the start of the season. With at-bats likely to be squeezed, it might be Arcia who gets bumped if that happens. With Mastroianni out of the picture for probably two months, their options for a call-up are not limited to the players on the 40.
have been the final out Friday. Bases loaded, two out, bottom of the ninth, Houston clinging to a one-run lead in Pittsburgh, and the Pirates' Russell Martin pops up to short right field. Jake Elmore settles under the ball, but right fielder Jimmy Paredes is having none of that. He runs into Elmore, the ball drops, two runs score and the Astros lose. It was the second time last week that Paredes ran into his second baseman. Jose Altuve — arguably the only Astro who deserves to be a major league regular — suffered a partial dislocation of his right jaw in Monday's collision, which is why Elmore was there to be Paredes' target Friday. The Astros had the majors' worst record each of the past two seasons, and they entered today 12-31. This is, astoundingly (astroundingly? ), not the worst record in baseball — the Miami Marlins are 11-32 — but the Astros are certainly a bad team. And if Paredes keeps playing right field like this, a dangerous one — for their second basemen. 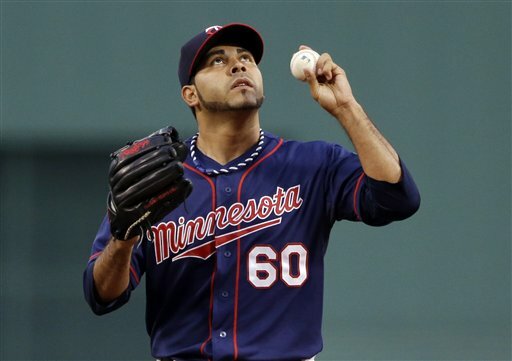 The Rafael Perez era ended Friday when the Twins released the veteran left-hander. He had shoulder surgery in 2012, and Cleveland let him go during the offseason. The Twins took a flier on him as spring training camps opened on the strength of a bullpen session, but once he was actually in camp their assessment of his current ability clearly diminished. He never threw a pitch in a spring training game and hadn't even joined a minor league team until this month. It's hardly worth criticizing the Twins for this episode; it was a minor league deal, a small investment that didn't pan out. This is unlike the Tsuyoshi Nishioka signing, which gave reason to wonder if there's a disconnect between the scouts and the major league staff. Still, it was a curious sequence of events. 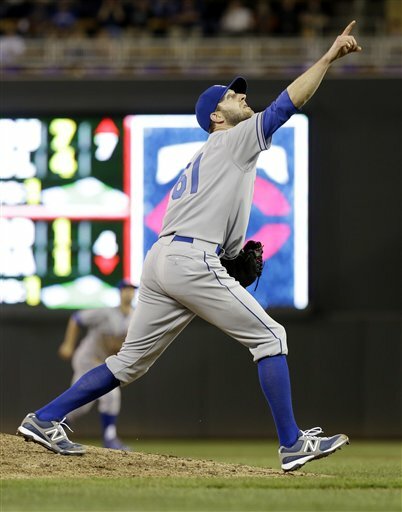 When the Twins signed Perez, they talked about stretching him out as a rotation candidate. As it turned out, he couldn't stretch out sufficiently to claim the lefty specialist role he was accustomed to with the Indians. The scouts saw something the coaching staff didn't see. Or maybe they were just throwing something against the wall to see if it stuck. 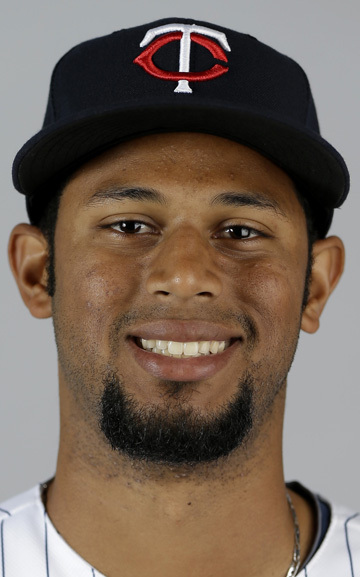 Perez wound up pitching four innings in Triple A — four innings in which he walked three men, struck out two and allowed one run, on a homer. He had an out clause in his deal — if not on the major league roster by May 1 he could elect free agency — and he waived that clause at the start of the month, but perhaps he and/or his agent think there's an opportunity elsewhere. A more significant investment gone sour — Alex Wimmers, the Twins' first-round draft pick in 2010 —took a step forward Friday with his first mound work since his ligament replacement surgery last summer. Wimmers threw all of five innings last season, and it remains to be seen if he sees any action in the minors in 2013. He was seen at draft time in 2010 as a high-floor, low-ceiling prospect; one of the attractions with him was the sense that he was nearly major-league ready. But nothing as worked out for him so far, and the floor has proven to be far lower than anticipated. Wimmers has thrown 62 minor league innings since signing. The Twins have enough invested in him to keep trying, but he's not the pitcher they drafted out of Ohio State, and he may never be that pitcher again. Bullpen candidate Tim Wood, who is on the 40-man roster, was shut down a few days before his rehab assignment was to expire early this week. An MRI on his balky shoulder was reportedly clean, but there's still clearly an issue of some sort and he's seeking a second opinion. Not long ago I was wondering how, or if, the Twins would find room for him in the major league bullpen. He didn't make it that far. Another example of the truth behind the claim that you never have enough pitchers. There's a better video embedded in this story from the Gazette of Cedar Rapids. Buxton has cooled off a bit — in the previous 10 games he had hit just .250, and his long streak of reaching base in every game had ended at 29. Still, nobody seems to believe the kid's going to spend the season in low-A ball. If I'm going to see "Buck" play there, I'd better get a move on. with his second home run of the game at Target Field. Adam Dunn hit three home runs against the Twins this week and missed out on a fourth only because Aaron Hicks reached over the center field fence to take one away from him. This outburst elevated Dunn's slash line on the season to .156/.255/.391. Combined with all the other flaws in his game, that should logically make him a release candidate. But the White Sox are committed to $15 million to him not only this season but next, so he's sticking around. Dunn has always been something of a litmus test on talent judgment. He does two things well, or at least did during his 20s, and again last season: draw walks and hit home runs. He was never a high-average hitter, but in his 20s Dunn hit 40 homers almost every season and salted the power with 100-plus walks. The result were on-base percentages around .380 and slugging percentages around .580. Those are strong markers. The flip side of it is, those were the only things he did to help. Even in his youth — he's 33 now — he couldn't run and had no defensive position. As for his approach to the game, I suspect his nickname of "Donkey" is at least as much about his stubbornness and unwillingness to adapt as for his strength. Dunn has often been described by stat-oriented writers as a "great" hitter; I think great hitters are more capable of adjusting than Dunn has been. Dunn has often been described as having great strike-zone judgment; I think he's more aware of his strike zone – the pitches and areas he can hit — than of the real strike zone, which is part of why he has led the majors four times in strikeouts. J.P. Riccardi, then the general manager of the Toronto Blue Jays, took a lot of flack from Dunn's admirers a while back when, in a radio interview, he dismissed the notion of trading for Dunn with a comment along the lines of He doesn't like to play baseball. That may not have been the best choice of words, but they evoke the sense that Dunn wasn't interested in shoring up the weak parts of his game. How fair that assessment was back then, I can't say. No amount of work was ever going to make Dunn a fast runner. Whether he really made an effort to become a good outfielder or first baseman, I don't know. Whether he ever tried to learn an alternative approach to hitting that was less boom or bust — something to be used when the tying run's on third base with one out — I don't know. Dunn's game has fallen off since he arrived in the American League; his slash line with the White Sox, in two-plus seasons, is a paltry .181/.309/.385. Yes, he had a big series against the Twins; I believe that was more about the flaws in the Twins pitching than about what Dunn brings to the table these days. Joe Mauer bops a first-inning single Tuesday evening. We're almost one fourth of the way through the regular season, and — surprise — Joe Mauer's hitting .340. It's been the most uneven season of his career so far. No. 7 was hitting .393 after a 2-for-4 game April 20. The next day he went hitless, and he finished the month 3-for-33, which lowered his season average to .287. He hasn't had a hitless game since, and he goes into today's game with a 13-game hitting streak. It's worth knowing, for comparison purposes, that the American League average with two strikes is .183 — .183/.252/.284 — and this paltry level of performance is normal. Hitting is difficult; hitting with two strikes is almost impossible. Striking out more often — Mauer has whiffed in about 24 percent of his official at-bats this year, as compared to a career rate of about 12.5 percent — and getting more hits with two strikes is a difficult combination to maintain, and I don't expect him to maintain it. He has reached two strikes in 47.1 percent of his career plate appearances; this year he's got to two strikes 56.9 percent of the time. I'm going to hazard the guess that if he's going to hit .340 this year and continue to challenge the single-season doubles record — and it's too early for me to get revved up about that notion — he'll need to have fewer two-strike at-bats. to his recently deceased cousin. He went just two innings. Pedro Hernandez is pretty clearly the Twins' fifth starter. Kevin Correia and Mike Pelfrey are veterans with multi-million dollar salaries; Scott Diamond and Vance Worley aren't as well paid as Correia and Pelfrey, but they are more-or-less established rotation arms. Hernandez is a relatively unheralded rookie with mediocre velocity and low expectations. Low expectations — that's an important factor with fifth starters. Hernandez on Monday went 5.1 innings — 16 outs — while allowing three runs. Not a quality start, but (a) he left with the lead and (b) most managers will take that from their fifth guy. The problem for the Twins is that they're getting that kind of start not only from Hernandez but from the rest of the rotation as well. The Twins have had six starts of seven innings or longer this season, four from Correia and one each from Diamond and Worley (and Correia's last two starts were five and 5.1 respectively.) 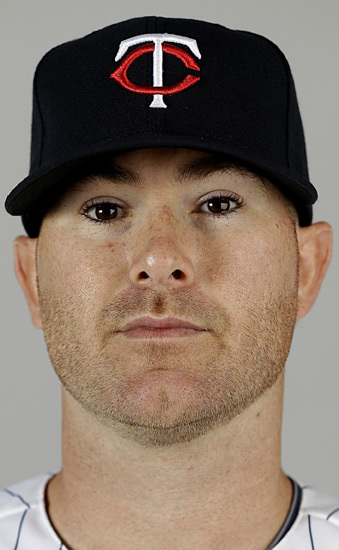 Pelfrey has two six inning starts, Hernandez has topped out at 5.1 innings and Liam Hendriks, the only other man to get a start so far, at five innings. But those guys are long men for a reason. The starters need to eat more innings. Only Correia is averaging more than six innings a start, and he's showing signs of receding to his usual level. And to eat more innings, they'll have to pitch better. Worley's ERA is 7.15; Pelfrey's is 6.03. They're making Hernandez' 5.79 look good. contract with Arizona last winter. The Twins entered the offseason with an obvious need to rebuild their starting rotation, and I suggested on this blog three specific free agent pitchers to target. I don't know if the Twins seriously pursued any of them. They certainly didn't land any of the three. And that may have been for the best. 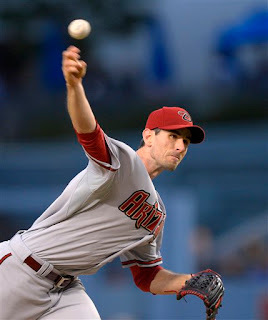 Brandon McCarthy signed with the Arizona Diamondbacks, for whom he is 0-3, 5.68 in eight starts. In 48 innings, he has allowed 68 hits, the most in the National League. At least he's pitching. John Lannan, working on a one-year, $2.5 million deal, made three starts for the Phillies, pitching just 14.2 innings, before hitting the disabled list with a knee injury. He's 0-1, 6.14. 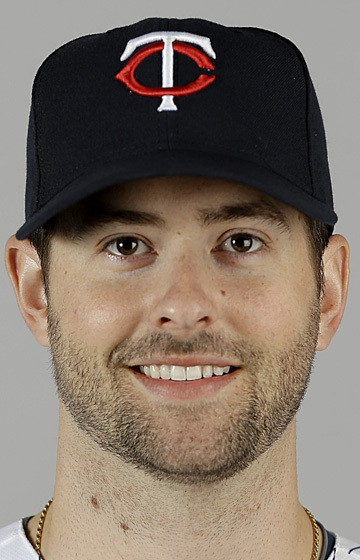 Shaun Marcum, who signed with the Mets for one year, $4 million — a comparable contract to the one Mike Pelfrey signed with the Twins — opened the season on the disabled list. He has returned to make three starts (and a relief appearance in a long extra-inning tilt): 0-3, 8.59. I rather expect McCarthy to turn things around — he's striking out more than five men for every walk issued so far — but but the injuries make me less optimistic about Lannan and Marcum, who were riskier targets to begin with. It certainly appears in mid-May that Terry Ryan and Co. did a better job of selecting their targets than I did. Pelfrey and Vance Worley aren't having spectacular starts to their season, but they are pitching, and Kevin Correia has gotten better results than could have been reasonably expected. "If you keep doing that, it will freeze on your face." a game-tying home run Wednesday in Cleveland. he thought Melvin was miming. I could no more umpire a major league game than I could pitch one. It's a difficult job. But it's not an impossible one. On Wednesday we had the botched home run review. On Thursday we had the umpiring crew that doesn't know the rules about pitching changes. It was a pretty lousy week in major league umpiring. 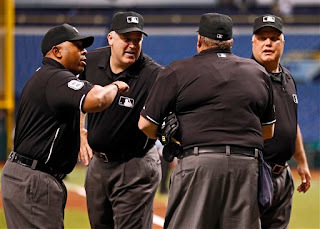 Angel Hernandez and Fieldin Culbreth are taking the heat in these fiascoes, and deservedly so, as the crew chiefs of the umpiring crews involved. Hernandez may not be the worst full-time major league umpire — I'd vote for "Balkin' Bob" Davidson for that dishonor — but he'd probably be bottom five on the list of most knowledgeable fans. So I was stunned to learn that he was crew chief. OK, acting crew chief. He was still the guy in charge of the umpiring crew. Even for one game, nothing good is going to come of putting Angel Hernandez in charge of the umpires. Peter Gammons theorizes that Hernandez refused to reverse the call Wednesday night because he's philosophically opposed to replay review. If true, that should be a firing offense. He doesn't get to pick the rules to follow. As I understand the replay process, three umpires watch the replay but the decision is made by the crew chief. I don't know what the other two umps in the room with Hernandez thought of the decision — MLB has gagged them all at this point — but it's certainly plausible that Hernandez overruled both. O'Nora the day after their rulebook fiasco. As bad as the non-home run call was, the failure of a different umpiring crew the next day to require a Houston pitcher to face a batter was worse. Hernandez' blunder was a judgment call; the Culbreth blunder was rulebook ignorance. Culbreth was suspended two games and the other three crew members fined on Friday. 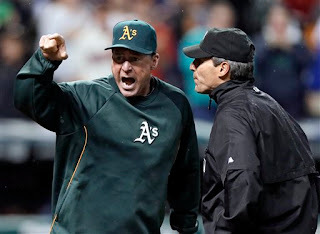 MLB seldom announces umpire discipline but did so Friday in an apparent attempt to demonstrate that they do too discipline the arbiters. In this case, the transparency appears to indicate a light touch; I was thinking before the announcement that a week's suspension for the crew chief, and shorter ones for any of the rest of the crew involved in the decision, would be appropriate. That the others were fined suggests that none of them realized that they couldn't let Houston manager Bo Porter pull his new pitcher because his Anaheim counterpart had sent up a pinch hitter. That one experienced major league ump can screw this up is astounding; that three others can agree is even worse. Porter clearly didn't know the rule either, but enforcing the rule book isn't his job. Still, his part in the incident should be embarrassing to him. He's got enough problems with a really bad team without having the umpires angry because he led some of them into a massive blunder. Regular readers of this blog know that each year I throw a little cash in the direction of the invaluable Baseball Reference website and sponsor the page(s) of one or more Twin or ex-Twin. Last year I sponsored the pages of Glen Perkins and Scott Diamond. I've let the Perkins page go to free agency, but this week I re-upped with Diamond ($45). I may at a later date pick another page to sponsor. This is the first time I've carried a sponsorship past one year. The first year I did this, I spread a limited budget around (Michael Cuddyer, Gene Larkin, Terry Steinbach). The second year I busted the budget big time and went for Joe Mauer. Last year, Perkins and Diamond. Diamond has become the first acknowledged MFT -- My Favorite Twin -- in years. The holders of the not-necessarily coveted title have been Bert Blyleven, Roy Smalley, Gary Gaetti, Chuck Knoblauch and Cristian Guzman. Johan Santana was an unacknowledged MFT -- I didn't realize he was MFT until he left. So unless and until BR decides to price Diamond as if he were indeed a gemstone, I'm likely to stick with him for some time. struck out 11 so far. The Twins take Rule 5 seriously. Over the years, they've probably mined more talent out of the leavings of rival farm systems than anybody. Johan Santana, Shane Mack, Scott Diamond, Gary Wayne ... and now Ryan Pressly. 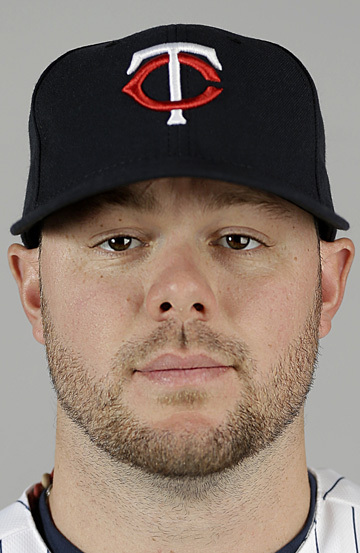 Pressly gave the Twins four innings of scoreless relief work Wednesday night and was credited with his first major league win. It came against the Red Sox — the team that drafted him, signed him, shifted him to the bullpen last summer and then left him off the 40-man roster in the fall. The Twins snagged Pressly in Rule 5, and he survived the numbers game in spring training, perhaps with help from some injuries. Pressly's 1.72 ERA perhaps overstates his effectiveness so far; in 15.2 innings, the 24-year-old right-hander has allowed 15 hits and eight walks. Four of the seven runs he's been charged with are unearned. He has been given few meaningful innings, and rightly so. Wednesday was an exception, and he got the call because Anthony Swarzak was used for three innings Monday and Josh Roenicke has been pitching with some frequency. Mike Bernadino of the Pioneer Press has said a few times that there are people in the organization who would like to try returning Pressly to starting. That notion fits the farm system's interest in shifting power arms from the bullpen to the rotation. But in Pressly's specific case, it should be noted that he scuffled as a starter in the Red Sox organization. He didn't emerge as a prospect until he was put in the bullpen. He has the kind of power arm that lends itself to an eventual late-inning role. I would be wary of taking him out of his success zone — especially since the Twins have a fairly hefty stockpile of starting alternatives in the high minors. If they want or need to swap out one of the five current starters — and they might want to do that with Pedro Hernandez — Kyle Gibson, Sam Deduno, Cole De Vries and Alex Meyer would seem wiser alternatives. In the final innings of Monday night's overly-long extra inning game in Boston, the Twins outfield had Ryan Doumit in left, Wilkin Ramirez in center and Chris Parmelee in right. This is not the Jamaican relay team when it comes to speed, and there were observers who wondered if Stephen Drew's game-winning double could have been caught by a genuine left fielder. Ron Gardenhire, hewing to the philosophy that one doesn't blame the player when the manager puts him in a position outside his skill set, avoided criticizing Doumit: I had my backup catcher out there. It occurred to me that Parmelee -- whose best position is probably first base -- might be the most accomplished outfielder of that trio. So this morning I dug into the plus/minus and runs saved defensive metrics devised and compiled by Baseball Info Systems. Please note: BIS itself says the metrics are best applied over years, not weeks. This is early May. So the numbers don't necessarily define individual skills. Parmelee is a bit below average in right, but not so much that he can be said to be hurting the team defensively. As of Wednesday morning he was listed at -4 in plus/minus but zero in runs saved. He's been better than I expected, but I wasn't expecting Dwight Evans from him either. 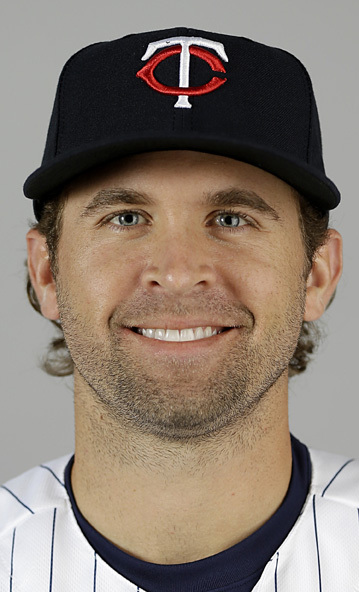 The best defensive player on the team has been Brian Dozier, +6 in plus/minus and 4 in runs saved at second base. Next best: shortstop Pedro Florimon, +4 and 2. The worst: Ramirez is a combined -6, -4 in just 48 innings around the outfield. Doumit has just three innings in left field, all on Monday; he grades out at -2, -1 in left. So, yeah, it appears that the BIS grading system figures Drew's ball was catchable. The news that former big league outfielder Otis Nixon was arrested over the weekend on cocaine charges didn't come as a complete shock. He'd been involved in cocaine before — suspended in 1991 for it — and in February he was the subject of a TV news report that claimed he was scamming the families of prison inmates. It has not been a good year for the now-54-year-old. Nixon, a very fast switch-hitter with no power, played for seemingly everybody over his 17-year career, and his path had two significant crossings with that of the Twins. His turn with the Twins came in 1998, when he was 39. It was actually one of his better seasons — he hit .297 with the highest OPS of his career (.705). He stole 37 bases and was caught seven times. It's my vague recollection that he was injured on a kick in the jaw on a play at second base; whatever was the cause, he missed most of May and only appeared in 110 games as a result. 1998 was a pivotal year for the Twins franchise. Look at their roster -- a bunch of old guys looking for another paycheck (Terry Steinbach, Paul Molitor, Nixon, Mike Morgan, Bob Tewksbury); another bunch of veterans who were basically never all that good (Ron Coomer, Marty Cordova, Pat Meares, Brent Gates, Orlando Merced); a handful of youngsters who played less than a dozen games each (Corey Koskie, A.J. Pierzynski, Torii Hunter, Doug Mientkiewicz). They went 70-92 and were, frankly, a bore. It's one thing to be a bad team; it's another to be bad with no future, and that was the 1998 Twins. After the season, the Pohlads issued a budgetary decree that forced Terry Ryan and Tom Kelly to stop pretending they could compete that way. The Twins went to the kids, and even though the 1999 and 2000 teams lost even more games, they were interesting — and in 2001 they were contenders. The other significant crossing was indirect. In fact, strictly speaking, Nixon wasn't even there. He was one of four men splitting time in the Atlanta Braves outfield in 1991, along with Ron Gant, David Justice and Lonnie Smith. He was easily the rangiest of the four outfielders, and also easily the least potent at the plate, although '91 was one of his more productive seasons. But his season ended in mid-September for his cocaine suspension, and the Braves went down the stretch and into the postseason with an outfield of Smith in left, Gant in center and Justice in right. Smith, although a speedy man, was a terrible defensive outfielder, and for the World Series games in the Metrodome, Bobby Cox used him as the designated hitter and deployed a backup first baseman, Brian Hunter, in left. Certainly had Nixon been available he would have played those Metrodome games. Twins fans who remember that World Series remember that the winning run in that classic Game 7 was set up by a bloop double to short left-center by Dan Gladden. What if Nixon had been in the Atlanta outfield? Would it have been a double, or even a base hit? Sunday, doubling his season total. Mike Pelfrey had his best start of the still-young season Sunday, and he did so against a Cleveland team that is producing runs with anybody in the league. He needed that strong outing. He entered the game with an ERA of 7.66, and pitchers with that kind of stat tend to lose their jobs. Even his six-inning, one-run Sunday left him with a 6.35 ERA, and that's not good either. For Triple A Rochester, the starter was Sam Deduno, hero of the World Baseball Classic. For low A Cedar Rapids, it was J.O. Berrios, the Puerto Rican teenager who is close to Meyer in status. Berrios isn't going to pitch in the majors this year, but the other three all are real possibilities ... and having them aligned with Pelfrey makes it theoretically easy to flip any of them into his place if and when the Twins pull the plug on the veteran. Deduno went five innings, allowing one run. Four walks, four strikeouts, 89 pitches, 51 strikes. Meyer was knocked out of the box in the fifth inning, allowing five runs in 4.2 innings. De Vires, making his first start since training camp, went just four innings. He allowed six hits and one run and was reportedly hit hard in the final inning. Berrios went six innings, allowing two runs and striking out eight (no walks). Even if the Twins were ready to pull the plug on Pelfrey, none of these guys are ready to step in right now. In a couple of weeks, it will be another story. 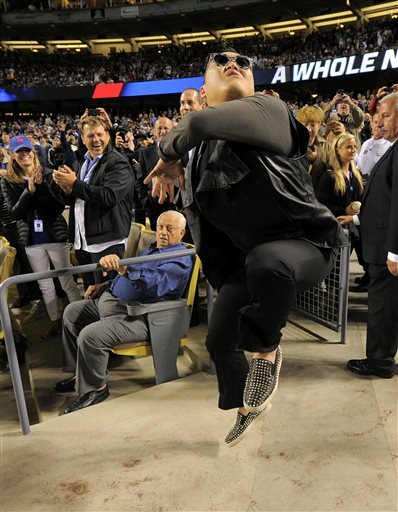 What makes this photo outstanding is the look on Tommy Lasorda's face. Yes, that's the Hall of Fame manager and buddy of Frank Sinatra sitting in the aisle seat wondering exactly when the world, or at least music, went to hell. Parmelee's seventh-inning homer head for the right field seats. Seventh inning Friday night. 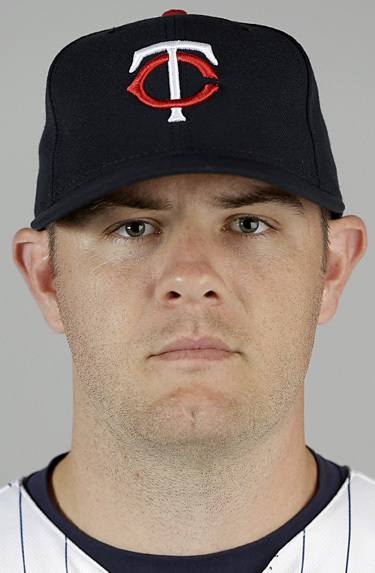 Cleveland's Justin Masterson has a 5-3 lead and gets the first two Twins hitters out. But then Justin Morneau singles, goes to second on a passed ball, and scores on a Ryan Doumit single. With the left-handed Chris Parmelee due up, Cleveland manager Terry Francona goes to his bullpen, but not for a LOOGY. He calls on a righty, Cody Allen. And Parmelee lofts a fly ball that barely sneaks over the right-field wall. Home run, Twins lead 6-5. The Twins didn't hold that lead, but I'm still intrigued by Francona's choice of relief pitcher. Why did he defy the platoon approach? Parmelee's career splits might be one factor. He's been a better hitter against left-handed pitchers (.782 on base plus slugging) than against righties (.738) in his brief major league career. But that's just 380 career plate appearances, which is not enough to declare him the rare exception to the platoon rule. Allen's platoon splits are even more limited — he has just 42.2 career innings — but they carry a hint of "backwards" platoon splits also. Righties have hit .273 off him; lefties .237. Righties have an OBP of .356; lefties, .318. But ... all four home runs he's allowed have been to left-handed hitters. Right-handers slug .295 off Allen so far, lefties .461. Francona knows a lot more about Allen than I do, and it's quite likely that Allen has a particular pitch that Francona believes is effective against left-handed hitters. It's also possible that he's just inconsistent enough with that pitch that he's vulnerable to the long ball with it. Picking a pitcher on that basis makes more sense to me than picking him off the limited statistical evidence available on Parmelee and Allen. 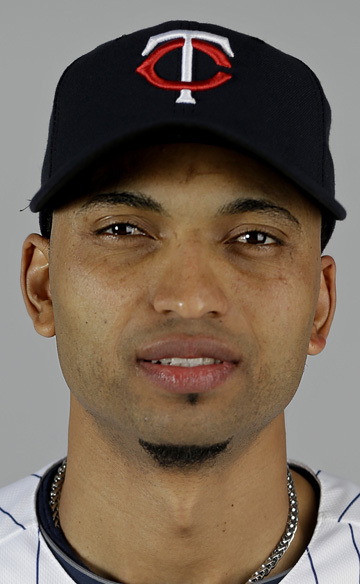 Aaron Hicks enters tonight's game in Cleveland with nine hits in 75 official at-bats, a .120 batting average. He has drawn 11 walks (while striking out 27 times), which is tied for 30th in the American League but still leaves him with an on-base percentage of .230. Ten games ago, Ron Gardenhire flip-flopped Hicks and Brian Dozier in the batting order. Hicks dropped to the eighth slot, Dozier to the leadoff slot. In the 10 games since he was dropped to the bottom of the order, Hicks' slash line is .214/.361/.250 -- still poor batting average, still little power, but a fine on-base percentage. He has in that period six hits, seven walks and one hit-by-pitch and has reached base at least once each game. He also has more walks than strikeouts. Better, but hardly ideal. The improved walk/strikeout rate is a reed to cling to, but the batting average and slugging percentage remain well south of acceptable. Hicks may be turning the corner on his rough start, but he hasn't completed the turnaround. Dozier has also improved since the switch. In 10 games as the No. 8 hitter, Dozier hit .152/.237/.212. In 10 games as the leadoff man, he's at .286/.311/.357 -- which isn't going to get him on any All-Star teams, but is good enough to stick with the current program. I fully expect that if and when Hicks starts contributing more at the plate than a few walks, he'll return to the leadoff job. I saw establishing Hicks as the center fielder and leadoff hitter as one of the Twins primary goals this season, and I don't think Dozier is the leadoff man of the future. short career, his day ERA is 3.32, his night ERA 4.27. Scott Diamond had his third straight quality start Wednesday, but it was the first time this season he was truly the ground-ball machine of 2012. According to Baseball Reference, he had 13 ground balls and five fly balls Wednesday, bringing him to a 40/35 split for the season. 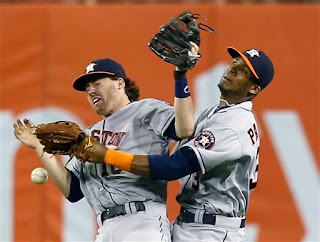 Diamond's breakout 2012 was all about avoiding walks and getting grounders, so Wednesday was a welcome sign. I'll pick a nit and say I'd like to see him break past six innings next time out; while the bullpen has been very good, the rotation needs to eat more outs. The Twins have used six starters so far. Vance Worley's had six starts, Kevin Correia and Mike Pelfrey five each, Diamond four, Liam Hendriks and Pedro Hernandez two each. 1) Semi-established: Diamond and Worley. These are the guys I can envision being part of the rotation for the next contending Twins team. Worley's had a difficult go of things so far: 0-4, 7.22 with less than 29 innings in the six starts, and his strikeout rate is down almost two per nine innings. Indications are that Worley's leash is long, and it ought to be. But he's not doing well. I'll give Diamond a C for the season so far. Worley has to be earning an F.
2) The disposable veterans: Correia and Pelfrey, the veterans brought in a free agents. I can't argue with Correia's results, even if I doubt he can sustain them. Pelfrey's been brutal. An A for Correia, another F for Pelfrey. 3) The fifth starters: Hendriks and Hernandez. I fully expect the Twins to cycle a number of pitchers through the rotation looking for someone to break through as Diamond did in 2012. Hendriks got the first shot and was quickly supplanted by Hernandez. I'll give Hendriks a D; he wasn't all that awful in his two starts, but he did get sent down, and unlike last year, he hasn't dominated Triple A upon his return. If and when the Twins swap out another rotation piece, it probably won't be Hendriks getting the call. Cole De Vries and Sam Deduno are more likely (not that either is ready yet). The left-handed Hernandez has split time between the rotation and long relief since his return, a pattern imposed by the offdays and weather problems, and has put up an ERA of 2.35, which is not to be sneered at. I'll give him a B, but, as with Correia, I don't really expect him to continue at that level. Here's a key difference between Diamond and Hernandez, at least as far as one can judge Hernandez off 15.1 innings: Hernandez does not appear to be a worm killer. Baseball Reference has him at 20 grounders and 30 fly balls so far. Rafael Perez, the former Cleveland Indians standout LOOGY now in the Twins organization, did not exercise his May 1 opt-out clause (if not in the majors by May 1, he could declare free agency). So he'll continue what appears to be a lengthy shoulder rehab, and maybe the Twins will eventually get something out his signing. Those seven have totaled 72 innings, with 65 strikeouts, 25 walks and 55 hits allowed. Combined ERA: 2.25. Only Roenicke has allowed a home run. There's really nobody there who deserves to lose his job. Which means there's an interesting decision ahead, because Tim Wood, who is out of options, is on his minor league rehab assignment. I believe he can be on that assignment a month, and he's about halfway through that period. By mid-month, Wood figures to be use-or-lose. Unless somebody in the current bullpen gets hurt or goes south, I don't see a place for him.